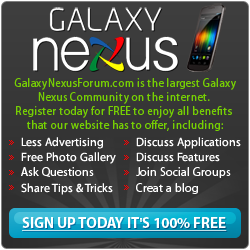 Below you will find a list of discussions in the Galaxy Nexus Support Forum forums at the Galaxy Nexus Forum - Samsung Galaxy Nexus Community. The Galaxy Nexus Support Forum forum is for discussion of: . If you need assistance with your Galaxy Nexus this is the section to ask. Can't seem to figure it out yourself? Stop in and ask the Rescue Squad Team.